Ask at the Reception Desk about Millie and we’ll supply you with an illustrated booklet in full colour telling Millie’s story. This acts as a guide round the Mill and you can use the clues it contains to find her baby mice. Fill in the activity sheet as you go along and then when you’ve finished let our Receptionist know how many you’ve found and you’ll get a special certificate plus a small reward. The Mouse Hunt is suited to children between the ages of 2 and 8. 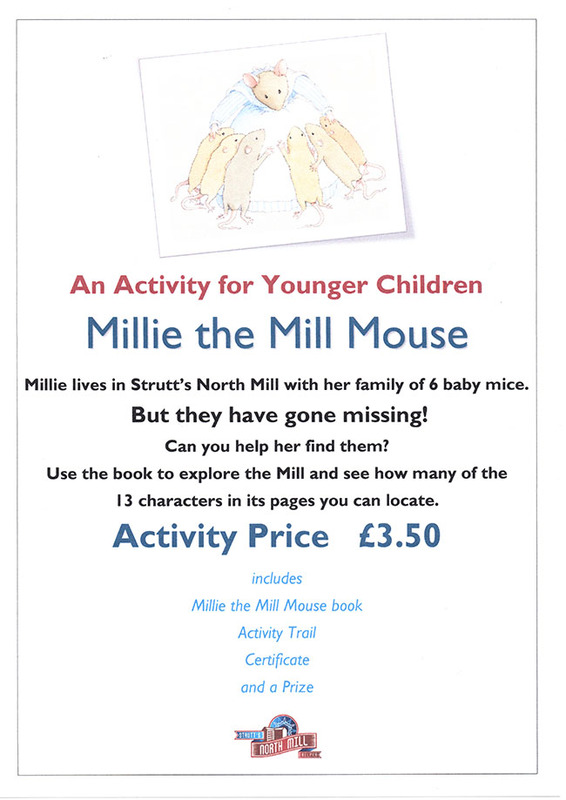 Please note children under 16 are admitted to Strutt’s North Mill free but we make a small charge of £3.50 for the Mouse Hunt. Alternatively, for £3.00 you can just buy the book. It makes a great stocking filler!